We can help you find the right executive coach or solution to meet your needs. You may also complete the form to help steer the conversation about your specific requirements. One of our team members will contact you. I read this volume with deep interest and through two sets of lenses; one as a Psychologist, and the other as an Executive Coach. I believe Cain’s basic mission in publishing this book is to bring the reader’s attention to how underutilized and undervalued introverts really are. She begins with the premise that we live in a broader value system she calls the “extrovert ideal”. That is to say, “there is an omnipresent belief that the ideal self is gregarious, alpha, and comfortable in the spotlight.” In contrast, Cain follows the extrovert ideal with a less than positive view of “introversion – along with its cousins, sensitivity, seriousness and shyness” which she believes is seen as “a second-class personality trait, somewhere between a disappointment and a pathology.” I certainly agree there are behaviors typically associated with extroversion that are highly valued by our society, in general, and organizations, in particular. Still, history is replete with Introverts, many of whom Cain identifies in the book, who have made significant contributions to society and have been highly valued in organizations. Throughout this book, Cain draws from research and case studies to make her points. She brings her concepts to life by delving deeply into how introverts have been hugely successful in a variety of roles including those requiring sales ability, presentation skills, creative thinking, and leadership. Cain also lays out numerous examples of ways people have dealt with being introverted. She cites a variety of “programs” directed toward extending and stretching their behaviors to more fully fit the Extrovert ideal. Certainly, one walks away from reading this book with the notion that it is contingent upon introverts to find ways to better fit in our extroverted society. Group and team problem solving stifles creativity. Individuals, most typically introverts, are better suited to coming up with unique and innovative solutions to problems. Forcing group think on others and conducting team brainstorming sessions is actually counterproductive. Introverts are capable of acting more like extroverts for “the sake of work they consider important, people they love, or anything they value highly.” Cain calls this “Free Trait Theory.” In essence, introverts can move outside their comfort zone when they see underlying value in what they are trying to accomplish. People flourish when they are engaged in occupations, roles or settings that are consistent with their personalities. In effect, there is much research supporting the notion that individuals gravitate toward work settings that play to their natural strengths. While the Extrovert Ideal is pervasive in Europe and the United States, the opposite is true in Asia. Interestingly, research cited by Cain demonstrates Asians are far more disposed toward introversion in both genetic and cultural terms. Cain goes into some detail regarding how behaviors that are rewarded in Asian American households throughout childhood, become difficulties when these children attend American universities that value the Extroverted Ideal. I believe this book can be quite useful in helping introverts better understand, and discover, ways to stretch themselves to be more effective. I have recommended it to some of my clients. At the same time, I have some concerns. In the Introduction, Cain presents research evidence that introversion has a genetic component. Of that, there is little doubt. She attempts to wrestle with the ever present nature-nurture debate. It is a debate that has been carried on in many venues and for many years. While Cain correctly notes “we are all gloriously complex individuals…and there are many different kinds of introverts and extroverts,” I could not help but feel that much of the book treats introversion/extroversion as dichotomous and, in some ways, seems to over simplify human nature. Cain, Susan (2012). 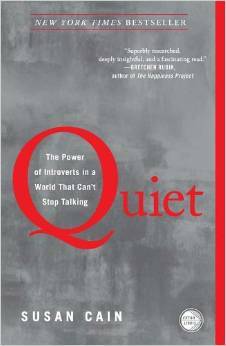 Quiet: The Power of Introverts in a World That Can't Stop Talking. New York: Crown.